The aptly named Opera Campervan (its style was inspired by the Opera House in Sydney) was designed by Axel Enthoven, a Belgian architect, with an eye for style and luxury. 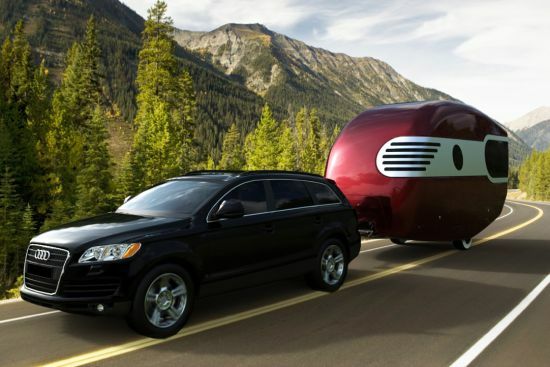 The concept of this canvas trailer is all about bringing the freedom of camping to those who want a little more comfort with their moveable surroundings. 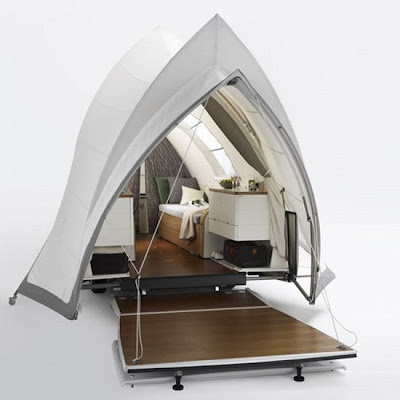 The trailer, which features a heap of leather and stainless steel, is big enough to house two beds (electronically adjustable), a teak veranda and a kitchen. 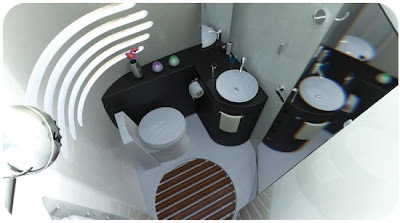 Also, there is an exterior shower, ceramic interior toilet, refrigerator, and hot and cold water along with hot air heating. The Opera, which retails for € 29.370,00, folds up quite compactly making it perfect to hitch to just about any vehicle. 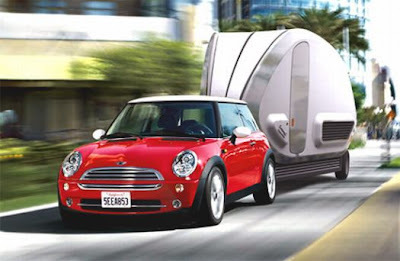 Not ready to buy your own campervan or trailer? Check out the great deals for campervan rentals at MotorhomeRoadtrip.com. 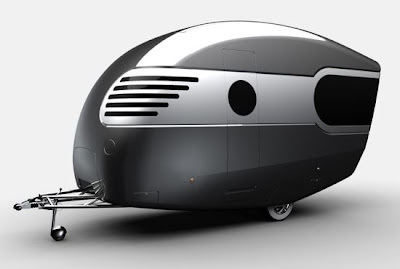 While caravans are not always synonymous with style this concept design from Bob Villa shows that the two words are not mutually exclusive. Indeed, Villa's design is proof positive that smooth, aerodynamic lines plus a great interior design add up to a campervan that just about anyone would be happy to drive--and sleep in. 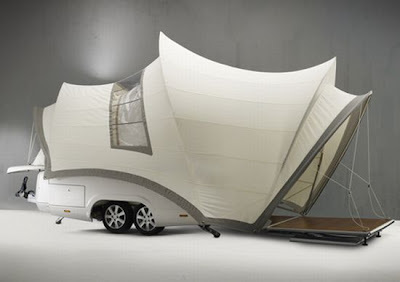 Does the outside of Villa's camper design remind you of something? The retro cool exterior was inspired by the 1950s and the Airstream campers of that time. We can see a bit of 50s diner cool in the details on this design. The layout for this campervan is also quite ingenious, especially considering how small and streamlined it looks from the outside. 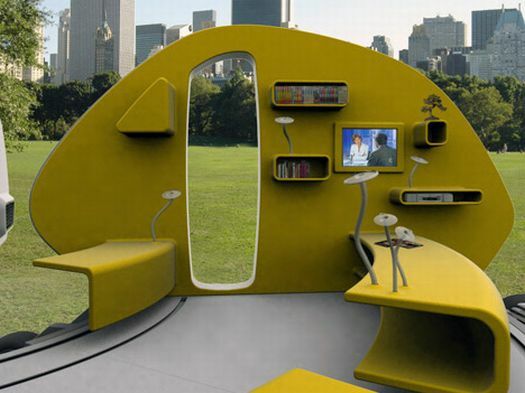 Features include a pop-up roof that you can control electronically, as well as a full-size bathroom and kitchen (with fold-up breakfast bar). The bedroom is tucked away upstairs, accessible via ladder, and there is also a second, stored mattress. The exterior rear of the camper folds down to allow for a patio-like outdoor area, perfect for relaxing when parked. All in all we'd say retro modern has rarely looked so good--or been so functional. If you're looking to plan a campervan rental vacation check out MotorhomeRoadtrip.com for some great tips and rental options! 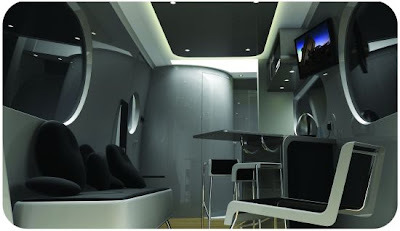 When James Curtis pictures the future of campervans the Case Van is what he sees. Curtis entered his design into a competition looking for the best concepts for future campers, and scored runner up status with his forward thinking idea. Curtis, Director of LATIS, an architecture design firm in London, sees future campervans as cube-like structures that will impress with their modular functionality. 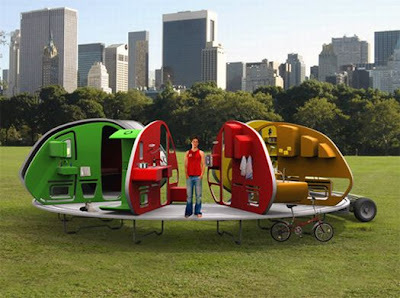 If these designs are anything to go by, future campers will also be much more attractive and unobtrusive than their current counterparts. 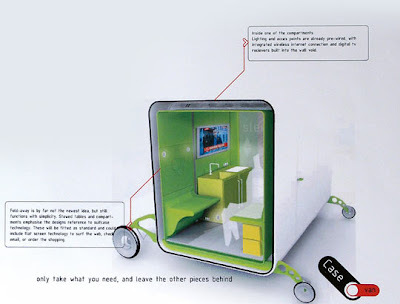 Curtis' design features built-in wiring, a flat screen for communication and WiFi, as well as smartly thought out fold aways to maximize space. While some tweaks would likely need to be made to this concept, if this is what the future looks like we're ready to embrace it. Looking for a campervan rental that's a bit roomier? Check out some great options at www.motorhomeroadtrip.com/rentals.